We woke in the US Embassy one week after we had set out on our bus ride to begin our trek of the Langtang valley. It had been the most comfortable secure night we had since then. The US Embassy was extremely solid and we didn’t even feel any aftershocks while we were in the building. The Embassy was still serving hot food to all those still sheltering there, so we had a nice warm breakfast with our companions, Corey and Kathleen. 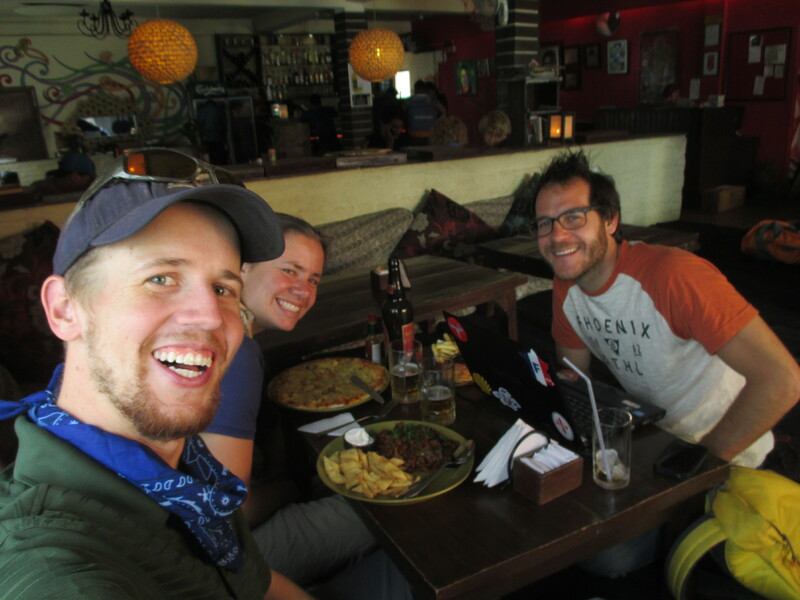 After some discussion, we all decided that we wanted to head back into Thamel, the backpacker center of Kathmandu. Kathleen wanted to continue to support the businesses there by buying some more souvenirs and we (and Corey) wanted to see if it was possible to pick up our things that we left when we went on the trek. 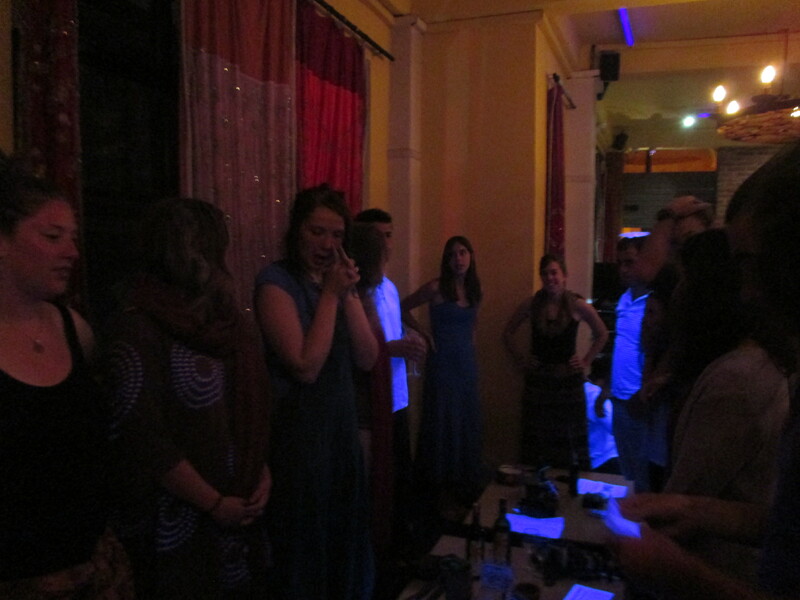 We had spent our previous nights in Kathmandu at the Hotel Bright Star, which we really enjoyed. The owner was an unbelievably kind man who had gone out of his way to help us. We still had his business card and were able to reach him on his cellphone. We were thankful to hear that his family were all safe and that he would meet us down the street from the hotel that morning. We wrote a bit more about the hotel before and after the quake in our post Kathmandu: Before the Quake. But, it still breaks our hearts. Hotel Bright Star was still standing after the quake, but the hotel right next door was completely destroyed. Unfortunately, there was also quite a bit of damage to Hotel Bright Star and we do not know when/if it will operate again. The owner had sent his family to Pokhara, but was waiting near his hotel for us (and several other trekkers) who had left stuff with him. His kind spirit in the face of his own personal tragedy is something we will never forget. This picture was taken a bit closer to the rubble by our friend Corey. We actually had a very nice meal at The Ship Restaurant before we left on our trek. We also visited Corey’s hotel and he was able to pick up his things as well. On our way back, Eric spotted someone he recognized on a scooter zipping past. It was Valerie (the French girl who had just celebrated her birthday with chocolate pancakes in Bamboo with us the day before) and her guide Srijan!! We called her name and they stopped to share their stories. 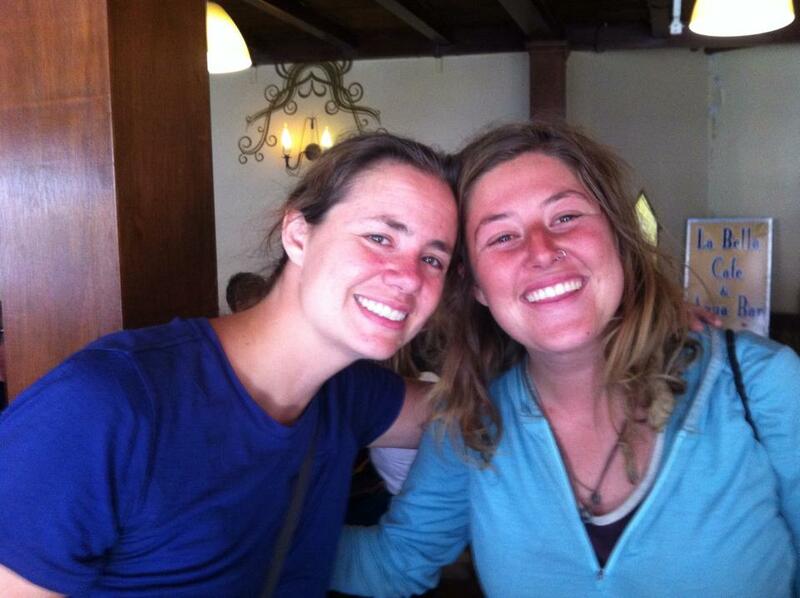 We were so glad that they had both safely made it back to Kathmandu. We weren’t overly surprised though, as we knew the French had been waiting on helicopters when we left Dhunche the day before. We had a brief but welcome reunion with them before we had to head on our way. We carried our bags back to where we had been planning to meet Kathleen. While we were waiting for her, Eric spotted a group of our Bamboo friends in the back of a taxi flying past us! (Yes, Eric is really observant and has good eyes!) We tried to follow them, but couldn’t catch up. Corey and Della grilled Eric to see if he could tell exactly who was in the taxi. He was pretty sure that it had been the South African couple and the Australian sisters. We were disappointed not to have spoken with them, but so thrilled that they had also arrived in Kathmandu from Dhunche. It had been quite hard for us to leave our Bamboo family there the day before. Corey had an idea for a place for us to eat lunch, so after we met back up with Kathleen, we headed that way. We had sat down (happy to see that the place was relatively undamaged and was serving food) and began to order. Suddenly, as we were looking out the glass doors of the restaurant we saw more people we knew: Aviv, Yonaton, and another Israeli friend from Bamboo! We ran out the doors (probably to the confusion of the wait staff) and called them back. After several hugs and brief summaries of rescue, they invited us to a reunion at the Chabad House in Kathmandu where the Israelis had already been planning to meet. We agreed we would see them there. We returned to our lunch but had to jump up again a few minutes later. We saw the Australian sisters walking by! Again, we ran to the street and experienced more hugs and short tales of helicopters before also inviting them to the Chabad house for the reunion. It turned out that the rest of our Bamboo team had all been taken from Dhunche to Kathmandu only that day via large Nepali military helicopters (aside from a few individuals who had made it on transports the day before). They told us that there was no one from the Bamboo team left in Dhunche when they left! At 1 pm on May 1, 6 days after the earthquake that stranded us all together, we met with our Bamboo team at the Chabad house. Unfortunately, not everyone was there, but through discussion, we now knew that everyone we had been with on the mountain had made it safely away. We had even been in touch with the Lithuanian brothers (who had walked out of Bamboo) via Facebook and knew they were on their way home. It was extremely emotional and we were all feeling thrilled to see each other in a safe place! We left each other that afternoon, only after agreeing to meet again for dinner to share each other’s company once more before people started leaving Nepal. By this point, the support operations at the embassy were clearly winding down. There were only a few others still sheltering there, and the staff were starting to take some deserved days of rest, so it felt quite empty at times. The Marines who guarded the embassy seemed to be ready to not have to worry about our security as well. We decided we should either leave the embassy or head home, and opted for the latter, booking a ticket back to the States for Sunday. We spent one more day in Kathmandu and went into Thamel once more. We made an effort to spend all of the cash we had brought with us on the trek buying souvenirs and donating to people who were working for relief. 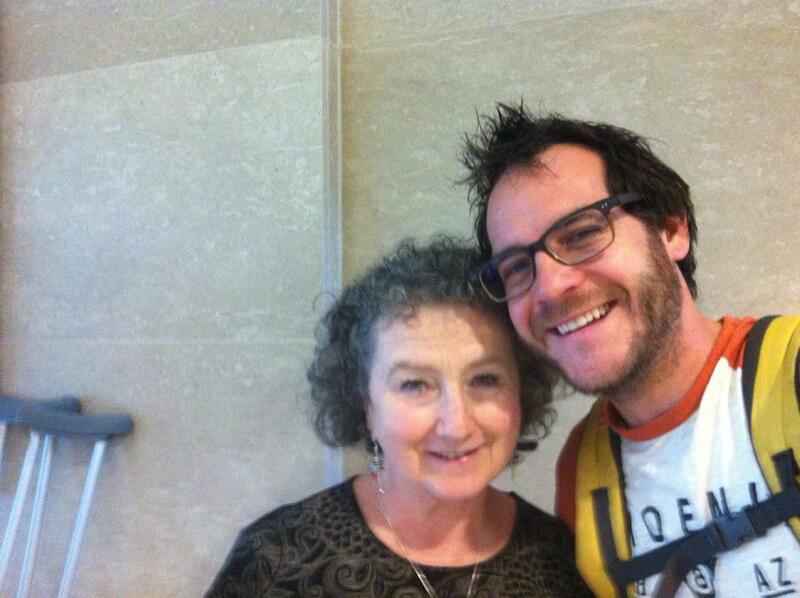 We said goodbye to Kathleen tearfully as she left for home. We shared a lovely meal at another one of Corey’s favorite restaurants before we too had to say goodbye to this beautiful but devastated country. On our way to the airport on Monday, May 3, we had a sobering discussion with our taxi driver. “Nepal is finished,” he said, “finished! Homes are destroyed, all tourists are leaving. There is no work. Nepal is finished!” We hope with all our being that he is far from correct. While we know there is a lot of effort needed to rebuild, we also know that there are a lot of dedicated people our there working very hard to do so. See this link for just some of the stories of people working to support Nepal. We hope that you’ll join them. In addition, Nepal is a beautiful country and will continue to be beautiful. Don’t take it out of your travel plans – they need tourism now more than ever. Let’s all help prove that taxi driver wrong! Great recounting. And I don’t agree with the cabnbi-Nepal is not finished.